Polk's Tavern, Unfeasible Tales of Social Justice Fantasy Science! Showdown at Polk’s Tavern! The Collected Edition. 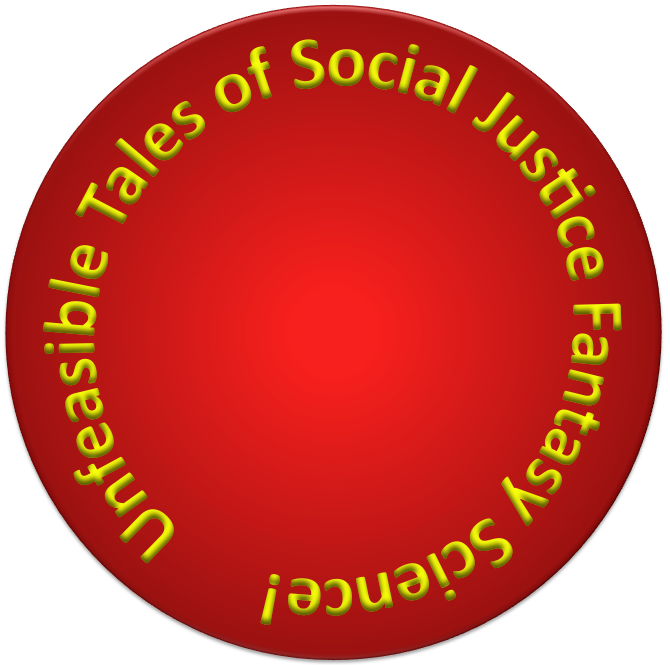 Unfeasible Tales of Social Justice Fantasy Science! Showdown at Polk’s Tavern! Finale! Unconscious at my feet was one of Mayor Hardy’s men. I was back on top of the same roof overlooking the centre of town. I had my spear, my shield and now a rifle. Durston and the dwarfs had worked on the rifle during the night and it was now substantially more accurate. The unconscious guard had kindly provided me with more ammunition. Stuck to the back of the wooden facade was a tiny machine that Durston had found in a compartment in his chest. The meeting with the god Orfon had done much for his memory. The machine was showing me a picture of the town much as a bird would see it. I looked up into the brightening sky and could just make out the black speck in the sky and I could just hear the sound it made. It was another machine that Durston had found inside himself. He called it a drone – I presume because it made the sound of a giant bee when in flight. I had stolen some of the clothes of the guard I had stunned. His waistcoat, gun-belt and wide-brimmed hat. It was not a great disguise but until the sun had fully risen it would give me a brief advantage if somebody came to check on this guard. I touched the machine in the way Durston had shown me and the image shifted colour. His drone could see heat as well as light and despite the poor light I could now see each of the guards scatter around the roof tops and hidden in the alleys of the two. Each one was shown as a bright yellow-orange glow like they were burning embers. It had taken me little more than half of an hour to master the rifle. It was a weapon for an idiot. As Durston had predicted my sharp vision meant that I had could shoot with great skill. I had few qualms about shooting Hardy’s men – I had grown up surrounded by seasoned warriors and I was ready for war if it was needed. Duration had been more concerned but had said that he could see no outcome that did not involve bloodshed. I steadied my nerves and waited for the signal. “:HARDY!” – It was Durston. I could see the glowing figures move suddenly in reaction to his appearance. The guards would have been watching the approaches to the town but in truth Durston had snuck in much earlier and had been hiding under a cart. He stood now bow-legged in the centre of town. He also wore a wide-brimmed hat and also a blanket into which he had cut a hole for his head. Under that he wore two gun-belts. He held his mechanical hands just above the two small guns on either side of the belts. He looked ridiculous but he claimed this was an essential ritualistic aspect of his plan. I could see on the machine that Hardy’s men were readying their rifles just waiting for a signal. Hardy appeared on a balcony above the entrance to Polk’s Tavern. Hardy’s men revealed themselves on the rooftops and from behind buildings. Some had rifles and some had hand guns. They each took aim at Durston and began to fire. As each bullet him, Durston staggered and black liquid would spurt out from under his poncho. This was my moment. I stood so that I could aim my rifle and began shooting specific targets I had identified. Ten shots and ten of Hardy’s men dead or injured. Despite this Hardy’s men did not notice their comrades being shot around them. They were too intent on shooting Durston and the sound of gunfire masked all other sounds. “Cease fire! Cease fire!” Hardy called to his men. Durston was still standing but his head was bowed and his hat was gone. His blanket dripped with a dark liquid that pooled around his feet. Durston’s hand swiftly pulled the handguns from the belts, even as Hardy’s men opened fire again. Durston’s hands moved in a blur as he fired the hand guns repeatedly. I stood again and began to pick off my next set of targets. The shooting at Durston was less accurate this time and many shots went wild. Hardy’s men were now ducking behind what cover they could find, unaware still that I was shooting from the rooftop. Durston now strode purposefully to an ally way. The men Hardy had stationed there fled as he walked towards them. Ducking into the shadows, Durston was now hidden from view. Many of Hardy’s men had now been shot and either killed or wounded. There was a kind of horror in using this rifle. At each death I did not feel a soul depart but instead the act of firing the gun felt both distant and immediate. It was too easy for me to point this rifle and simply choose for one of these men to die. A man on a horse game galloping into the centre of town apparently oblivious to the gun fight. He called out as he came close to the tavern that the dwarf mine was in revolt and that reinforcements were needed. This was my signal for the next stage in our assault on Hardy’s troops. I dropped the rifle and picked up my spear and shield. I then took Durston’s device from the wall and found the button he had shown me to use. Before setting off for town, Durston had strapped wine skins too his chest, back and sides. Each one was filled with a flammable oil that the dwarfs provided. The wine skins were then hidden under the blanket that Durston was wearing. Their first purpose was to fool Hary’s men into thinking that their shots were having some effect. Each shot had caused the oil to spray out from under the blanket that Durston wore. In truth the bullets were neither fast enough nor heavy enough to even dent Durston’s body and he feared that if Hardy’s men had simply seen the bullets bounce off him, that they would have not stayed to fight him. Although they would be more demoralised now having failed to kill Durston there was still a danger that they would abandon the town and fight the more easily killed dwarfs. I made my way silently off the roof and down into an alley. I could track the movements of Hardy’s mean around the town as they hunted for Durston and I couldn’t stay still for very long. Luckily we had a diversion planned. In the center of the roads where Durston had first called out to Hardy, was a black pool of oil and on the oil was a tiny explosive that Durston had fashioned – and explosive that could be trigged by the button the device. I pressed the button just after the man on the horse passed the pool of oil. It burst into flame with a ‘whumpf’ and a thick black smoke began pouring out from the flames. I counted for a minute until the smoke was thick enough and then ran as fast as I could to the other side of the street and then down an alley by the side of the tavern. I climbed a drain pipe and found a part open upstairs window that looked out onto the alley. It took a little time for me to swing myself onto the windowsill and then into the room beyond. I landed with a bit more noise than I wanted. I was in a small bedroom which luckily for me was empty. I walked to the door and listened carefully for any sounds. Hearing nothing close by, I opened it slowly an looked out into a corridor. Hardy did not have men patrolling the corridors so I made my way towards the front of the building. A pair of double doors led to what I suspected would be the room with balcony from which Hardy had spoken earlier. I could hear loud voices talking in side presumably debating the events outside. I counted for a few seconds and then pressed the button on the device again. This was a signal to Durston who was still at large somewhere in the town. A sudden appealing wailing noise erupted. It was loud and persistent and un-ignorable. Durston had explained that he was equipped with such ‘sirens’ to help warn people of encroaching fires. I hoped that Hardy and his guards had rushed to the balcony to see what the noise was and then I opened the door and stepped into the room. As we had expected Hardy was outside on the balcony. He had three guards with him and the room itself was empty. I quickly found a hiding place and waited. Durston’s siren cut off as quickly as it had started and outside I could hear the mad rush of Hardy’s men combing through the town looking for their quarry. I could hear the sound of the balcony doors being shut to keep out the acrid smoke and then hardy barking orders to his guards. I listened carefully to their footfalls as all three of the men left the room – two to stand guard at the door and one to fetch the messenger from the mine. I counted to twelve and then stepped from my hiding place. Hardy had his back to me. I could have killed him with my spear there and then but we would still have had the rest of his men to deal with. I walked up to him in silence and then with a sharp blow with my shield knocked him unconscious. I had to catch his heavy body as he fell so the sound would not alert his guards outside. I secured the door and then pulled furniture to the door to make a more solid barricade. Naturally the guards heard this but found that they could not open the door. I had enough time to move what I needed to before they began trying to kick down the door in earnest. I went back to Hardy. I tied his hands and removed his gun belt. He was beginning to stir, so I stood back and waited for him to come to. His guards outside the door were really throwing their shoulders into their attempt to open the door but with a heavy desk behind it there wasn’t much movement. Hardy’s eyes flickered open. I levelled my spear at his face. Our hope was that Birchall would be free to move around town after speaking to Hardy the night before. She knew enough of the townsfolk to be able to judge who might listen to reason or even turn against Hardy if the conditions were right. Durston had explained to he about his siren and so now, wherever she was she should have been waiting for me to appear with Hardy. With Hardy awake and under threat of being skewered, it was easy to get him to order his guards to stand down and stop hammering on the door. I didn’t doubt that they realised that he was speaking under duress but I just need a little time for the plan to work. I dragged hardy out onto the balcony and kept the point of my spear pushing against his ribs as a reminder of who held the weapon. “Call all your men.” I growled at him. The smoke from the small oil fire was now dying down but the air still stank. The rising sun was now illuminating the town more fully and as Hardy called out to his mean, figures emerged from the shadowy lanes where they had been hunting for Durston. Hardy’s men held tightly to their guns but with another poke in his ribs Hardy called for them all to drop their weapons. As the rifles and handguns dropped to the ground, Durston reappeared. He casually walked among the med picking up guns one by one and bending their barrels. The horror on the men’s faces as Durston demonstrated his strength only grew as we walked among apparently completely unharmed despite all their efforts. Birchall too had been busy and from the buildings and houses other citizens of the town were emerging into the smoke-tinged air. “What do you want me to say?” He growled back. Hardy sighed and then looked out at the gathering crowd. “I had the children murdered.” he said but too quietly for the crowd to hear. I just snarled in responses. “I HAD THE CHILDREN MURDERED.” Hardy spoke now with the voice he used that could carry his words out to a mob. There were cries of horror and astonishment and not just from the ordinary townsfolk. Clearly many of Hardy’s men were also unaware of how he had manipulated them all with fear. Birchall and three men pushed their way through the crowd and made their way into the tavern. I ushered Hardy back into the room and made him, at spearpoint, pull the barricade from the door. As he did so his two guards burst through the door with their guns ready. They hesitated when they saw that I held my spear at Hardy’s neck. Whatever move the guards were planning was cut short by the arrival of Birchall with three of the townsfolk with her. The guards surrendered and were disarmed. I led Hardy down the stairs and out of the tavern. The crowd on the street looked murderous but the hate was all directed at Hardy. Without his small army he was now a pathetic figure. Robbed of his power over the town, he seemed physically diminished. Several of the townsfolk were armed and had their weapons pointed at Hardy. I stepped away from him and lowered my spear. I turned to look for Durston when a gun shot rang out behind me and something struck my shoulder with a burning punch. More shots rang out almost in the same instant as I turned to see what had occurred. Hardy had a small gun concealed in his jacket and he had taken one last shot at me. Barely had I begun to turn than Hardy himself had been shot down by the townsfolk. Birchall rushed over to me and within moments Durston was there two but a rushing sound in my ears like an approaching tide obscured their words and I lost control over my consciousness and fainted. By what means Durston left us, I never knew. When I awoke some hours later he was gone. Perhaps Orfon had returned him to his proper time or perhaps he had simply walked away. Birchall negotiated with what remained of Hardy’s men at the mine and prevented a bloody last stand that would have left many dwarfs and men dead. The human town and the dwarf mine were not at peace exactly but the violence of Hardy’s cruel occupation of the mine had ended and both parties needed each for trade. I never returned to my glade. Time was flowing differently on the plains and despite several attempts, I found that I could not successfully navigate back along the old elf road. Our world was begin to drift in many directions and each direction was becoming a world unto itself. I hope that the elves of Ledrg Glade still exist in some world sundered from this one. I stayed for awhile in Bridge Town. The people were not evil or malicious but I think they resented the guilt they felt at Hardy’s actions. Some of Hardy’s men settled down and others drifted away and several died in fights or in gaol. The dwarfs rewarded me with some light armour and enough silver to buy a decent horse and saddle. I decided to head west, to see if I could find a navigable route through the desert beyond the canyon. With decent supplies and my elvish scout skills I was confident that I would have more luck than the dwarfs who had tried to escape that way during Hardy’s regime. I had my sigil shield and my spear to protect me. I had as well the rifle that Durston had altered. Gromley had blessed it but I was still wary of it – yet it was also the only physical reminder I had of my good friend the robot man. As I rode off past the mine both Birchall and Gromley said their goodbyes. I had waited until near the end of the day, confident that with elvish sight I could make better speed in the cool of the night. I waved back to them both as I crested a small hill and then I rode off – into the sunset. Gromley paused. “The guards at the cell won’t bother checking on the prisoner and the other guards rarely come to this level. “There seems to be very few guards for such a large mine.” I observed. “A single guard with a gun can dominate a whole tunnel.” replied Gromley as we walked across the vandalised temple. “And even if we did re-take the mine we would be essentially trapped with no food. If we somehow broke out of the mine we would still need to take the bridge and even if we did that Hardy was many more armed men in the town. We are dwarfs, we regard war as favoured solution to complex problems and yet we find ourselves dying by degrees with no way to fight our enemy. Ah! This way.” Gromley motioned to yet another secret door that had opened from the inside. A younger dwarfish acolyte signalled for us all to follow after him. “I am sorry your temple was ruined.” I said to Gromley as we walked down another passage. “So you are not a priest of Embran?” I asked, puzzled. “Of Embran? No, no. I only survived this long because my cult prefers secrecy to open worship.” We turned a corner and before us was a proper stone door, clearly marked with a rune chiselled into the rock. I gasped in recognition. “:Ofron? What is he the god of?” Asked Durston. The door seemed to dissolve before use, revealing a tall woman standing in the centre of a painted chamber. He hair was long and an orange read and spilled in great locks over her naked skin that was the colour of ochre. She fixed us with a star that seemed to peer into all our eyes at once and her own eyes seemed to flicker with yellow sparks. Rather than sensing her soul I felt her soul envelope the whole room as if she was nothing but soul and nothing but some abstract essence of herself, as if the solidity of the rock about was nothing but a mist and the weight of our lives nothing but the passing shapes of clouds. I don’t recall walking into the temple of Orfon but I must have done. I don’t recall speaking but I knew that we conversed for some time before I could pull my own wits back together. I gasped for breath as if I had been overcome with smoke and grasped hard onto my spear for support. “You brought Durston to my woodlands. Why?” I asked. “:I really don’t know how this god business works ~ but can’t you just smite your enemies with lightning or something?” Durston asked. “To be a god is to be the essence of a thing. I do not plan or scheme or plot. I do not cogitate on my actions. I just am and to act is to be. I answered the prayers of my servant and interceded on behalf of his clan. You were my act of will.” Orfon replied. “But you must have thought there would be some consequence to summoning Durston?” I asked. “Your people needed to learn, the humans here needed to learn.” Orfon replied. I went to leap at this god creature with my spear and cut a hole into Orfon’s gut but Birchall and Gromley grabbed my arms before I could skewer her. I had to stoop low to see the base of Durston’s shell and the task was made harder as Durston himself was trying to turn and tilt his head to try and see what was written on his bottom. I used my sigil shield and concentrated on the tiny characters. “Bushfire Advanced Response Reconnaissance Unit” I read. “Then, for what it is worth, you have my blessing.” and with those words the god departed. “:Well the good news is that I have a plan.” said Durston, apparently unfazed by having met a divine essence. “:The problem is this. The dwarfs can take the mine ~ but if they do then Hardy sends more men from town. ~ Hardy can besiege the mine and starve the dwarfs out. Birchall agreed and explained that most went along with Hardy out of fear. I nodded as I thought through Durston’s plan. “So we need to fight him and his men in town and show that he isn’t unbeatable?” I asked. “A shoot out?” said Birchall. “I’ve never shot one of these guns before.” I said, surprised. The tunnel was broad and sandy. Pastor Birchall moved with confidence despite the poor light, which surprised me given how poor the eyesight of men is. It also strongly suggested that Birchall was very familiar with these passages, which was unlikely unless the pastor had reason to regularly sneak into the mine. We reached a small cave with no clear exit other than a hole in the centre of the floor. Birchall motioned me over and spoke very quietly. I was nervous waiting in that cave with only one exit other than a vertical drop. I felt trapped but I also reasoned that it would be an overly elaborate trap given that Mayor Hardy had access to many men armed with guns. If Birchall was bent on betrayal it was a scheme I could make no sense of and for the time being, trust seemed to be the wiser option. We waited in silence. The Pastor seemed to be meditating. I simply sat and concentrated on what I could sense. I could feel the pastor’s soul but elves cannot see the inner-workings of a soul, despite what the rumours claim. At best I could tell that Birchall was not some demon or supernatural being, which was not particularly reassuring. Tap, tap, tap. Three little taps on the wall of the cave. Birchall motioned silence again and stood carefully and then tapped in a more complex rhythm on the wall. Those taps were answered by a different rhythm and Birchall responded again with yet another rhythm. Then silence. With a sudden creak, a section of the cave wall began to move and a dwarf poked his head through the space. He looked me up and down distrustingly and then at Birchall for reassurance. Birchall nodded and the dwarf pushed the open section of the wall further ajar. I stepped through, with Birchall in front and the dwarf now behind me. There is little love between dwarfs and elves and I can almost taste the dwarf’s mistrust as we hurried in near silence through some dimly lit tunnels. On two occasions the ritual with the tapping was repeated and on each occasion a hidden passage was revealed and we were passed onto the care of a different dwarf. Finally we reached a cave that was about the size of a dinning hall. It was furnished with roughly hewn stone seats and the most recent dwarf to chaperone us told us to sit and wait. An elderly dwarf dressed in the robes of a priest entered and sat down on a stone chair near us. I looked at Birchall and cursed my observational skills. For a scout who thought themselves well versed in lore about humans I had singularly failed to notice that the pastor was actually a woman. I realised that I had been misled by the humans around her – which, as my understanding blossomed, meant that she was in disguise and had hidden her gender from her fellow humans. I found her rationale to be odd but I had little understanding of the ways of her people or her god and so I did not quiz her further about her actions. The priest introduced himself to me as Gromley, a priest of Embran and I shook his hand and explained that I was Green-bark of the Ledrg Glade of the sylvan elves. He nodded and said that he had read of the glade and knew that it could be reached by following the road. I then unwrapped the rifles and gun-belts from my cloak and laid them out on the floor. Gromley was astonished to see the weapons and then looked fearful. Gromley led us out of the cave and into another set of tunnels. He talked quietly as we walked. “Hardy came some years ago to Bridge Town. We had always had good relations with the various tribes of humans that had settled there. Dwarfs had always been welcome at Polk’s Tavern even from they very start when Polk himself had started it. “Now this man Hardy came along at a time when things were bad for us all. The war and the chaos of time that followed had made trade very bad for the dwarf mines. The land between the mines and the dwarf settlements further on, had become a foul desert. Everything on the plains was in flux and it seemed that every year the humans advanced in ways we didn’t understand. They increasingly had little use for what we could manufacture but now they craved the metal we dug from the ground even more. “Foolishly we entered a bargain with Hardy for food and supplies but as time went on we found ourselves even more in debt to him. Then dwarf children went missing and to our horror one was found out in the plains half eaten by wolves. Our lamentations were great and it seemed that Hardy was sympathetic towards us – human children had been killed as well it seemed. He claimed that savage humans were seeking out children of both humans and dwarfs for evil rituals. We should have doubted such an absurdity but we were so struck by grief that we did not think on his words or see what he hoped to gain. Gromley’s tale explained much of what I had seen. Hardy had a strong grip on the town built on fear and armed bullies. I was about to ask about what Birchall and he had been doing since, when we came to a dead-end. “We subtly damaged the locks on the other cells so that the guards would put your friend in this one.” Gromley whispered. He repeated a tapping pattern which was answered shortly after. “All clear.” whispered Birchall as Gromley opened yet another secret door. I stepped through into the cell and waved my hands at Durston and mimed that he should be silent. Durston waved his hands back excitedly and then as quietly as he could manage followed me out of the cell. Gromley closed the secret door behind us and we set off back down the tunnel. “:Oh Green-bark! I am so glad you are safe. ~ I have been worried sick for hours!” said Durston as we walked through the passages. “How on earth did you get captured?” I tried to sound cross but I was too happy to see him safe. “I see.” I said, which I thought was the safest response. Gromley then brought us all to a stop. “Months ago I set us on a path that I hoped would bring my people salvation. That is still my hope but I would not have unwilling allies in this conflict. Elf Green-bark, Mechanical Man Durston, I would formally ask you for your aid but before I do so, there is somebody you must speak with. As the crowd dispersed and the Mayor departed, I clambered down from my vantage point and headed to the edge of town nearest the canyon. Hardy’s men had put Durston on the cart and were heading towards the bridge. Outside of town the darkness was now almost complete as there was no moon and only starlight. I knew that the men would have difficulty seeing anything beyond what their oil lamps illuminated and so it was easy for me to follow them unobserved simply by walking in utter silence. I considered using my spear to kill one man at a time but if they fired their guns wildly into the dark I couldn’t be sure I wouldn’t be hit accidentally. Fifteen minutes out of town it became clear that I had a new problem if I wanted to follow the cart further. The bridge over the canyon was lit with oil lamps and had two guards posted at its start armed with rifles. I moved quicker but ran at an angle to the road so that I reached the canyon outside of the ring of light cast by the lamps. I watched as the guards spoke to the men with the cart. They talked for a shot while and then the guards motioned the cart onto the bridge. The bridge itself was elf built and crossed the canyon in a graceful arc. I peered out across the canyon in an attempt to see if there were guards at the other end but if there were I couldn’t see them. I decided to wait a few minutes so that the cart would be well onto the bridge. The I rushed the guards from the side. As they were looking out onto the road they did not see me running up from the side and they couldn’t hear my soft tread over the night noises. The first guard I hit square in the face with my sigil shield and he dropped like a branch. The second had enough warning to try and get his rifle pointed at me but within a moment I was within his guard and I hit him twice with the blunt end of my spear – once to the stomach and then a sharp blow to his head as he bent double. Both men lay unconscious before me. I pulled their rifles off them and then, with more caution undid their gun belts so that I had their smaller guns also. The second man began groaning as if he was regaining consciousness, so I levelled the point of my spear one handed at his neck, ready to slice his throat if I needed to. Damn – I should have been more alert and paid more attention to the sounds around me. Some man had caught me unawares. I turned my head slowly to see Pastor Birchall standing a few metres away from me. “The Mayor’s tame priest, is it?” I said. “You and him seemed like good friends back in town. He said that you had warned him my friend was on his way.” I said and then with a twist of my wrist I presented the sigil shield towards the stirring guard and whispered a sigil of sleep upon him. I could now turn safely to face the pastor properly with my spear and shield ready. “Please do not judge me by what you have seen. I aim only to serve god. I had hoped to make Mayor Hardy see sense and end his mistreatment of the dwarfs. His actions are not godly towards them and it is my duty to minister to all gods creatures whatever their size. The dwarf priest summoned something – I do not know what as they would not speak of it to me – and I hoped that fear would make the Mayor see his way back to righteousness.” The Pastor’s pleading seemed self -serving but I was struck by how Birchall’s concern had been first for the guards rather than personal safety. I looked back to the bridge. “I’ll trust you and let these men live if you help me.” The Pastor nodded. “Then first you need to tie the hands of the men and their feet and help me move them. Then you will show me where they have taken my friend. The Pastor agreed and soon we were both walking across the bridge. Birchall explained that the mine on the other side had several armed guards but that he knew of a secret entrance to the mine. There was a gatehouse and guards at the other end of the bridge but it looked over the gate to the mine rather than directly at the bridge and so, unless we were very unfortunate, it should be possible to sneak into the mine. The guards, it seemed were more concerned about dwarfs sneaking out then others sneaking in. Still I decided to be prudent and let Birchall walk ahead of me, while I held my spear and shield at the ready. We moved swiftly across the bridge without any event and reached the other side within a few minutes. I could see the guard house and as Birchall had said it was positioned to watch visitors the main gate of the mine. Birchall pointed in a direction that took us close to the cliff edge. I followed and we reach a path that led along and slightly down the cliff face. Eventually we reached a broad boulder that appeared to be obstructing the cliff path. Birchall pressed his hands onto the rock and it shifted to reveal a small entrance. The pastor ducked into this hole and with little choice open to me, I ducked in after him. I was in the dwarf mines. I swore quietly. I was torn between sneaking back down and mingling into the crowd or staying where I was. A bustling crowd would make it easy to move around town in safety and unquestioned but a crowd of men could turn violent and if relations between the elves and men in this town were poor, it might not be wise. On the roof I had a good view and I was in relative safety but I couldn’t really hear what was being said. I dithered between choices as the crows pushed Durston into the centre of town. I knew that he was strong but I was not sure if he had the emotional strength to defend himself properly. The crowd was only getting noisier but there was no signs of violence yet aside from the guns pointed at Durston. A man led a horse pulling a flat four wheeled cart through the crowd and in front of the drinking house. Shortly after four men were assisted on to the cart so they could stand above the crowd. One man was tall and balding and had a large grey moustache but no beard. He was dressed in black. Two younger men stood either side of him. Neither man wore armour or carried a sword but they stood with an aggressive watchfulness that marked them out as bodyguards for the tall man in black. The fourth man was shorter and of a similar age to the man in black. He wore a waistcoat on which was a silver metal star. All but the man in black wore broad brimmed hats. The man with the star badge pulled something from his belt, pointed it upwards and then made it emit three loud bangs. BANG BANG BANG. I was so startled that I nearly lost my footing. This must have been a smaller kind of gun that could be more easily carried than a rifle. The crowd became silent and turned towards the men on the cart. Durston was pushed forward until he stood near the cart. “Somebody bring Pastor Birchall.” called out the man in black. A few people darted off from the crowd, presumably to search for this pastor. The chatter of the crowd began to increase again until the man with the star stood at the edge of the crowd and called to quiet. “Mayor Hardy has some words to say to you all. So you listen to the boss now all of you.” he said with the tone of a man borrowing somebody else authority. “Thank you Sheriff,” said the man in black who I now knew was Mayor Hardy. “People of Bridge Town. You know me and you know what I’ve done for you all. When I came here eight years ago there was little more than the ramshackle huts of the natives and Polk’s Tavern here was half its size. I’ve given your work and I’ve paid you well.” The crowd murmured assent. I looked around and could see some of the light elves standing off to one side – listening but staying slightly separate from the crowd. “Now what I expect from you all is hard work and respect for my authority. That is your duty towards me. In return I have a duty towards you. That duty is to keep this town prosperous and to protect you all from the threats all around us. We are surrounded, good people. We are surrounded by ungodly creatures. Elves, dwarfs, savage natives and demonic forces – they all wish us ill. My job is to stand between you and those threats – to keep a steady watch against the evil forces arraigned against us.” One of Mayor Hardy’s bodyguards touched his arm and whispered something to him. Onto the cart clambered ungracefully a thin nervous man of an age I couldn’t determine. He was also dressed largely in black but wore no hat. Mayor Hardy put an arm around his shoulder and pulled him to the front of the cart. “Not six months ago the pastor came to me – didn’t you Pastor Birchall?” the nervous man nodded but seemed to nervous to speak. “And do you know what he told me? He told me that a threat was on its way – a terrible threat of a kind we had never seen. The Pastor is a man of god and he saw… he saw this in a vision good people! He saw in a vision that some foul demonic power of the ungrateful dwarfs had summoned a new monster to attack our town.” The Mayor paused as the murmuring among the crowd had become louder as the news of this demonic threat sank in. “BE QUIET!! !” roared the Sheriff and then nodded at the Mayor to continue. I became even more worried for Durston as this speech went on as it seemed to be increasing the fear and hatred in the crowd. Yet I could see no way of intervening that could possibly help Durston. I would need some kind of substantial distraction and more luck than I could possibly hope for. “Bring the creature forward!” called out the Mayor. The men guarding Durston pushed him closer to the cart. “Look upon this thing, good people! Do we not see all the trickery and perfidy of the dwarfish race exemplified in this aping of the human form? Know that it is only our god that can truly create life and that to attempt to do so is heresy of the worst order. Is that not true Pastor.” The mayor turned towards the obviously terrified priest, who nodded nervously as if he feared that it was he who was on trial. “:oh, well um thank you. Good evening, Mr Mayor sir, ladies and gentlemen of Bridge Town, Mr Sheriff and Pastor Birchall and the two nice gentlemen on the cart whose names I didn’t hear. ~ Firstly let me say I very much admire you hats. ~ I think your town is most charming and I hope you do not find it condescending if I say that it is ‘quaint’ ~ and an excellent example of nineteenth century frontier architecture. I’d like to thank you all for inviting me into your town ~ and coming out in such numbers to say, if I may, ‘howdy’. Please let me say a most gracious ‘howdy you all’ back. The crowd and the men on the cart looked as flabbergasted as I suppose I did after listening to Durston’s semi-intelligible polite ramblings. However, after that initial pause some man in the crowd shouted out “KILL IT!” and the crowd broke into shouting – some in favour and some against. The Sheriff stepped forward and once again shot three times into the air with his small gun. BANG BANG BANG. The crowd quieted themselves and the Mayor spoke again. “I have heard that some Occidental queen had a mechanical man that can play chess. I have also heard of automatons on display in the big east coast cities. Are you saying that you are a mechanical man of that kind?” said the Mayor. “:Well strictly speaking not the same ~ but I think the comparison is a reasonable one within the parameters of this conversation. What I really need though is to speak with a priest dedicated to Embran or perhaps a blacksmith?” Durston cocked his head slightly as he spoke as if this would make him see less threatening. Our third day proceeded much as our second had done. I rode for awhile on Durston’s shoulders and we stopped so that I could eat some lunch near a stream. In the afternoon we began to see more signs of life. The grass was greener but shorter and we saw cattle in the distance – not bison but dairy cows grazing. To me that suggested that human settlements must be near but we saw nobody for much of the afternoon. It was not until evening that we crested a small rise and saw about 3 kilometres away a human town. It did not look, even from that distance, as I expected. The stories I’d read of human towns were either those of nomadic peoples (tents, earthworks and stockades) or the settled warrior clans (stone castles and villages). This town was neither. As we walked closer I could see that it was made up of many large buildings built variously of wood, stone and brick. Most had angled roofs and many had painted facades. Although no one passed on the road we could see riders and carts moving on two other roads that led from the town. Durston was humming a tune to himself quietly and seemed excited to be approaching this strange town. Durston stopped in his tracks. “:That is a matter I hadn’t considered. ~ Yes, they may very well be quite heavily armed I am afraid. ~ If their technology is consistent with the other indications of historical period then they will be well armed with guns. ~ A kind of projectile weapon Ms Green-bark, that fires a heavy slug of metal by means of small explosives. ~ Very dangerous and highly effective.” He attempted to describe the workings of a gun and their various types but perhaps realised that I could not truly follow what he was saying. But amid the usual unintelligibility of his speech, I understood Durston’s warning. Things had changed drastically on the plains. Time had changed and the humans of the plains had changed with it. Even before the war it was the way of men to supplant one another in vast wars for territory and while men had neither the same skills or talents as dwarfs and elves they had a cunning inventiveness that now would have been multiplied by hundreds of years, and those years had simply not passed for my tribe in the woodlands. We left the road and made use of the cover of rocks and bushes to make our way to a creek in a ditch that ran into a culvert under the road. We followed the creek back to the road so that we could be close to the town without being easily observed. From the ditch we could see the town more closely. Although the light was fading the town itself was brightly lit and we could see that there were watchmen with what Durston called ‘rifles’ standing on the roofs of some of the buildings. Being able to see the town told us little more than we knew already. I slid further down into the ditch and called Durston down to talk to me. I explained that if there where other elves in the town then I could probably move around safely. Elves would always come to the aid of another elf in the event of them being threatened by a human, dwarf or goblin. If the town was just men or men and dwarfs then it might be much less safe for me to show myself. Durston countered that in his world people would think of elves and dwarfs as imaginary and it might be that the people of this strange town might be more like the people from Durston’s world than mine. I thought about that but whichever way I looked at it, my path was clear. I told Durston to hide in the culvert – his appearance was far too strange to explain to anybody. I would sneak into town using all my skills as a scout. If the men with guns couldn’t see me then I had nothing to fear from their weapons. Reluctantly Durston agreed. The sun had set and full dark was approaching. I moved swiftly and silently and moved with an agility than I can no longer muster. I felt a guilty pleasure at leaving Durston behind. He had been a charming and capable companion but he did not move with elegance or with the whole attention of one’s spirit the way an elf scout must learn to move. I reached the outskirts of the town and ducked under fences and slipped past half broken down stables until I reached the safe shadow of a building wall. I could hear the breathing of the guard on the roof above me despite the noise of the town. He smelt of sweat and leather and a burnt stench that I couldn’t place, like he had been trying to char mud. I knew that he couldn’t see me and I edged my way from the main street and around the back of the building. In this way I slipped between shadows until I was deep into the town, having passed unobserved by a few armed men. I moved closer to the noise and the lights and then used a pipe, that must have been used to drain rain from the the roof, to climb up higher. I reached the roof of the building. It had a steep pitch and was covered in slates but at its front, facing the street, it had a high facade that would have hidden the roof from view. There were no guards on this roof and the other buildings would obstruct the view of the building of any guards on the outskirts of the town. I crept to a small gap in the facade and found that I had a perfect vantage point at which to see the centre of the town. I had guessed already from the voices and snatches of music that the town was a lively place. The people of the town seemed mainly to be men – by which I mean male humans. I could see some more brightly dressed humans that I guessed were women, as it was customary among the humans that I had read of, for the women to dress differently from the men. I could also see a few elves scattered about. The elves seemed less engaged in the life of the town but it heartened me to see them. As far as I could tell they were light elves from the Yellow Mountains – which put them along way from home. I also saw two dwarfs but both looked to be in a sorry state. Neither wore armour, and it is customary for dwarfs to wear armour at all times outside of their homes both as a mark of status and as an expression of their culture and tribal affiliations. Durston had also mentioned ‘cowboys’ but no chimeric half-bovine creatures could be seen in the street. I could not hear any conversation properly but merely snatches or words or shouted expressions. Everyone was speaking a kind of mannish but it was a dialect I could grasps quickly using the skills that had been taught to me and the glamours of my sigil shield. The centre of the town was a cross roads. The major axis of the town led in one direction to the road Durston and I had walked down and in the other direction too what I hoped would be the bridge over the canyon to the dwarf mines. The other axis led to roads out of town – one toward the yellow mountains and the other toward the sea – although both destinations were many days ride from the town. I watched the people in the town for a few minutes and seeing that nobody was being actively harassed and that town was not hostile to elves, I decided that I would head back to Durston and report what I had seen. I had just started to climb along the roof slates when I heard the sound of men cheering and horses. A pack of people were coming down the street from the direction of the road I had been walking on. Some younger men ran ahead and rushed into what looked like a drinking house. Shortly after people began spilling out of the same drinking house and onto the street. A crowd quickly formed as the pack of men arrived. There were four men holding rifles surrounded by several more and in the centre of this pack, with rifles trained on him, was Durston.